In 1636 a syndicate headed by Sir David Kirke was granted all of Newfoundland by Charles I in return for services against the French in Canada a decade earlier. In 1637 Kirke, his wife Lady Sara, and their sons arrived at Ferryland and dispossessed Calvert's representative, William Hill, from the Mansion House. Shortly afterwards the settlement became known as the Pool Plantation. Shown here are two sides of a tobacco pipe with the monogram DK, clearly the property of Sir David sometime in the 1640s. In 2001 the remains of a large dwelling, measuring about 64 feet by 23 feet were uncovered. The house was built shortly after the arrival of the Kirkes and involved the demolition of the bakery/brewhouse that stood in the same location. In the following image can be seen fireplaces at either end of the house, a cobble pavement that formed part of the interior floor and the remains of joists of a wood floor. The two pipes shown in the previous image indicate that the house was occupied by the family of Sir David Kirke. 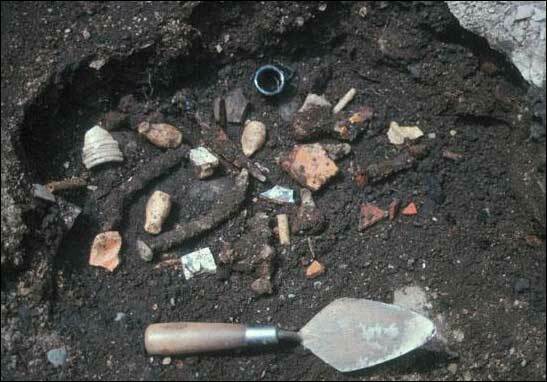 South of the cobble street, immediately north of the Kirke house, a deep midden revealed thousands of objects discarded during the 17th century. 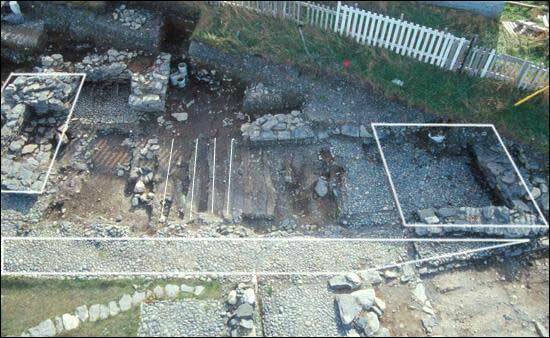 The upper layers of the midden have been most extensively explored, and have revealed the presence of a family of the Ferryland gentry. This illustration shows a number of artifacts exposed in a small portion of the midden. Artifacts unearthed in a midden. A midden is an old dump for domestic waste. 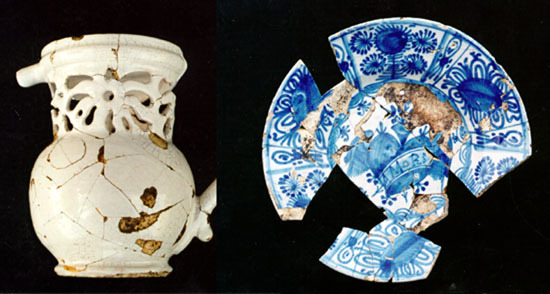 Ceramics from the midden include fragments of many expensive tin-glazed (Delft) vessels. 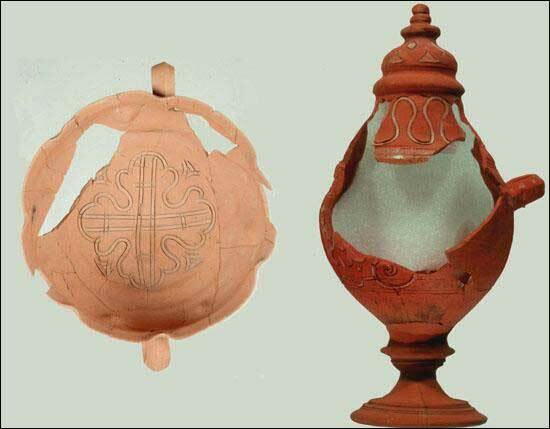 The "puzzle jug" on the left in the image below was probably made in the Netherlands in the second half of the 17th century. The Portuguese plate on the right bears the word "Amors," (love) and was sometimes used to carry rings at a wedding ceremony. The most expensive ceramics from the Kirke house were made in Estremoz, Portugal, during the 16th and 17th centuries. 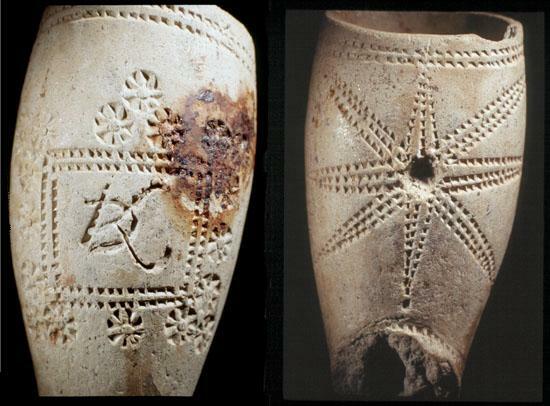 Sometimes called terra sigillata, only a few vessels have been found in Europe and none elsewhere in the New World. They must have belonged to members of the gentry, for they are of a style that was purchased by Philip II of Spain as gifts for his daughters. 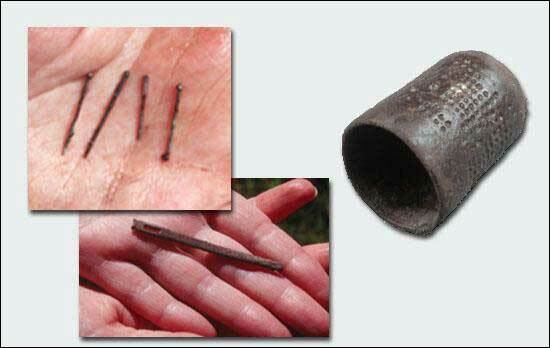 Sewing implements from the Kirke midden include a silver thimble, silver pins and a silver bodkin. Usually made from copper, brass or iron, these objects further indicate the upper class status of the Kirke family. 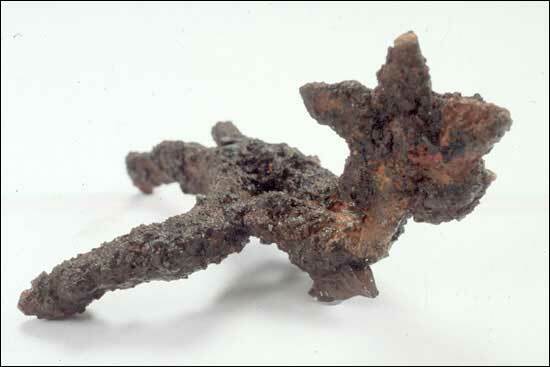 A silver-plated iron boot spur was found in the midden. Not necessarily a horseman's equipment, spurs were a standard part of a gentleman's costume until about mid-century. 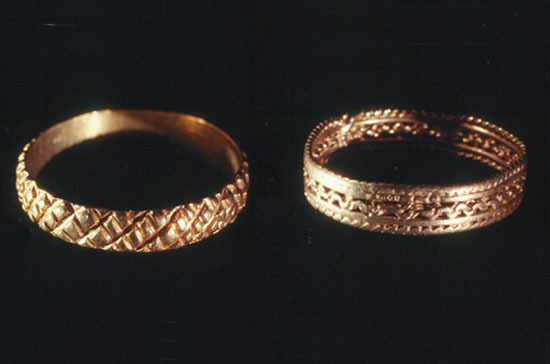 Two gold finger rings were found in the uppermost layer of the midden. Both are women's rings and may have been lost during the French attack on Ferryland in the fall of 1696. Women's gold finger rings from the Kirke house midden. 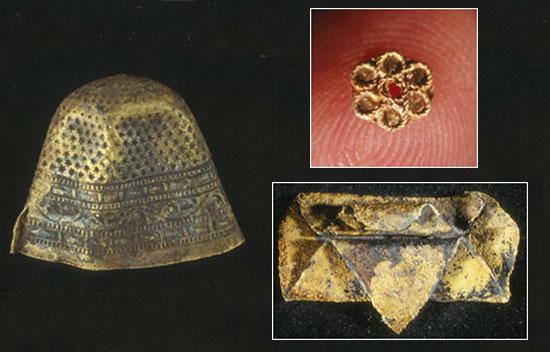 From the nearby ditch, and also from the last years of the Pool Plantation, came these gold objects: a thimble, a tiny sequin or stud and a supposed ornament of uncertain function.